The kamikaze phenomenon did not arise spontaneously but rather resulted from the Japanese national psychology, molded by ancient and mystical traditions, in response to desperate circumstances near the end of World War II. Bernard Millot tries to make this argument in Divine Thunder, a historical overview of the Japanese suicide pilots. This book was originally published in French in 1970, and the English translation came out the following year. The book was also translated into Japanese. Bernard Millot is a French aviation journalist and historian and is the author of a two-volume history of the Pacific War. The first two chapters cover the historical background leading up to Japan's use of kamikaze pilots against the American fleet. The first chapter deals with Japan's ancient traditions such as the bushido code followed by the samurai, and the second one gives several examples during World War II when Japanese soldiers willingly sacrificed themselves to inflict damage on the enemy. Chapters 3 to 8 summarize the history of the kamikazes from the creation of the first kamikaze corps in October 1944 until the end of the war, with one chapter devoted to nautical kamikazes such as the kaiten torpedo steered inside by a pilot toward its target. The first half of the final chapter contains details on several suicide planes under development but never employed by the end of the war. This section has little relevance to the book's overall theme. The last half of the final chapter provides conclusions on Japan's use of the kamikaze pilot. Millot classifies the kamikaze pilots into three psychological categories. First, some pilots were spontaneous heroes who firmly embraced Japan's martial tradition and who possessed a strong sense of patriotism. Second, some men with deep religious beliefs accepted self-sacrifice as a way of elevating themselves spiritually. The third category consisted of men who thought logically that suicide attacks were the only way to deliver a damaging blow against the enemy. Although Millot's categorization of the pilots into three types may have some merit, he provides almost no evidence to support such an analysis. He briefly mentions final letters written by the pilots and includes two long letters in the book, but he does not even indicate to which category these pilots belong. He also fails to mention that the military usually censored the pilots' correspondence, so some last letters may not represent their true beliefs and feelings. Finally, the author never considers that there may have been another category of pilots who did not really support the kamikaze attacks but decided to carry them out only because of social pressure and military discipline. Much of the source material for Divine Thunder comes directly from a few well-known published sources on the kamikazes and the Pacific War. 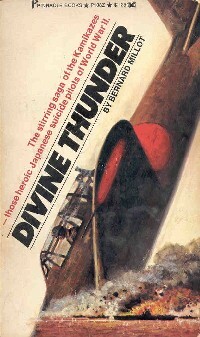 For example, the book's two letters written by kamikaze pilots were first published more than a decade earlier (1958) in The Divine Wind by Inoguchi and Nakajima. The book also lacks Japanese sources other than a few works translated into English. Although the book's descriptions of the overall history of kamikaze operations seem generally accurate, at times Millot will make statements with little or no support. For example, he mentions the "Japanese have a deeply mystical turn of mind" (p. 11), "their mystical predisposition toward self-sacrifice" (p. 65), and "the mystically patriotic fervor" behind the kamikaze attacks (p. 67). However, he never really explains this so-called mysticism and how it related to the creation of the kamikaze suicide missions. Readers who want a general history of Japanese kamikaze operations should avoid this book and try either The Divine Wind by Inoguchi and Nakajima or The Sacred Warriors by Warner and Warner. In comparison to Divine Thunder, these two books have more original material and provide better reasoning and support for their conclusions.